My Kids Stole My Brain: BLACK FRIDAY SNEAK PEEK! 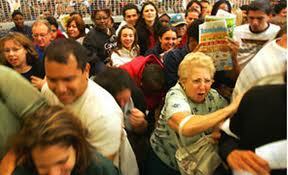 There's just something about BLACK FRIDAY that gets my blood pumping. It's crazy because I've actually only shopped (shoved, clawed & weaseled my way through the crowds) on BLACK FRIDAY twice in my life. Don't get me wrong, I love a great deal just as much as the next person and I'm pretty competitive, but those people are CRAZY and many of them are willing to do just about ANYTHING to get what they want. But for those of you still brave (insane) enough to hit the stores (risk your lives) on BLACK FRIDAY (or BLACK THURSDAY as it's slowing morphing into), you'll be happy to know some stores are already offering a sneak peek at their DOORBUSTER DEALS (see link below). Just be careful, because that little old lady standing next to you might look innocent enough, but I promise you, she'll flatten you like a pancake if you're standing between her and her $499 FLATSCREEN...I'm just saying! 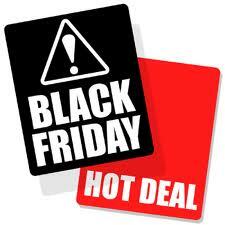 CLICK HERE ---> BLACK FRIDAY DOORBUSTER DEALS!